This chocolate peppermint fudge recipe is a wonderful Christmas treat. 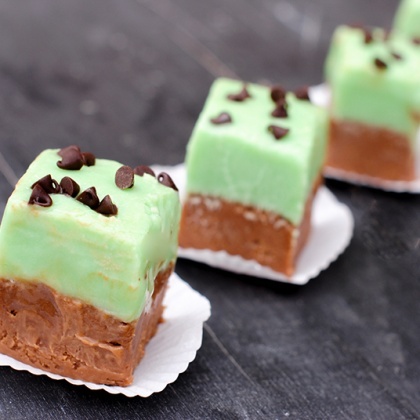 The bottom layer is chocolate fudge and the top layer is mint, with mini chocolate chips sprinkled on top. This will be a huge hit with family and friends. Starting with the chocolate layer-Combine the sugar, marshmallows, and milk in a large pan. Heat it and bring it to a soft boil. Boil (soft boil) for 6 minutes. *Be careful here. It likes to spit while it boils and I have a nasty burn on my arm to prove it. Wear long sleeves, use your biggest pan, just be careful! Cook the same way that you did for your bottom layer. Add you peppermint extract and food coloring when you are adding the chips and butter. Use as much or as little green food coloring as you want to make it pretty. Pour on top of your bottom layer and let it sit for 10-15 minutes till it is slightly cooled but not set, then sprinkle with mini chips and put in the fridge. Turn off the heat. Add chocolate chips and butter and stir until completely combined. Pour into well greased 8 x 8 inch pan. Place in refrigerator for several hours until completely set. Then proceed to mint layer.